What better than an ULTIMATUM of book writing. 50,000 words in 30 days. There’s support, and other crazy people doing the same thing. I’m talking about Ruth, have you seen her? I discovered Ruth my first year in Austin. I didn’t have cable, so it was the 4 or 5 fuzzy channels. She’s on Travis County Access, doing “Seniorcise”. She’ll have a chair and like a ribbon, and do some arm circles, sway a little, sit, stand up, sit, repeat. It’s old people exercise. I ate a whole bag of Doritos and watched the entire 30 minute routine the first time I saw her in her pink socks and pink shorts and pink shirt and pink earrings. It’s HILARIOUS. I mean, good for her, right? I don’t know many 70-somethings with that much mobility and energy (not to MENTION their own TV show). I love music. Blues on the Green last night got me excited. I can’t wait for ACL! The lineup came out today. I’ve got a highlighter and tape to self laminate the color printed maps and schedules I’ve printed. Blues on the Green is a concert series they set up at Zilker Park downtown. I’ve never been to a concert where I was able to pay less attention to the music. There were way more people than I had expected and I’m surprised this is the first time I went (and that it was Velvet’s idea). They had a great setup going – vendors and that sort of stuff – and the night cooled down perfectly. I’ve made the improvement to my ACL plan to actually bring stuff this time and stop trying to tough out three days in the sun sans luggage. Mike, my husband, is a great concert companion since he does not actually care what we listen to, as it all sounds like “hippie crap” to him. At least he doesn’t whine. In the meantime, since I only write when I’m feeling inspired, I was truly considering something Austin-unique to branch out. I wanted to try something new and different. All signs point to kickball. 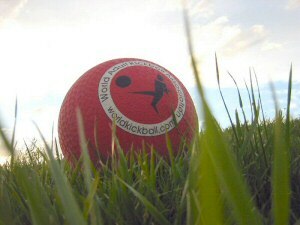 Yes, the Austin Sports and Social Club has a kickball league. Now I know what you are thinking – – – I am the most talented sporting female athlete you’ve EVER seen. Well, maybe not, but the good news is you spend most of the time drinking and relatively little time being humiliated. I can handle that. For starters, I’m about to relieve myself of a little thing I call WORK. Second, I’m going to write a book. A good one. Thirdly, I’m going to PUBLISH this book. The plan might need a little work. You get the idea. This whole “blogging” thing is going to take some getting used to. Hey, I’m only 4 years late or so. Why does someone start a blog? Usually, they love LOST or celebrity babies or D&D. I love none of these things. But I’ve got some spare time on my hands. Writers are supposed to write every day, I’m hoping this will help improve me.